St. Martin's Griffin, 9780312610777, 144pp. 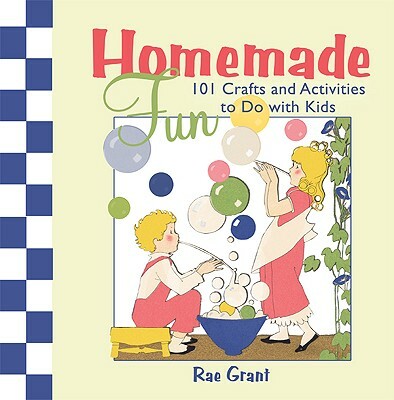 Homemade Fun is Rae Grant's third charming family activity book. Like the previous books in the series, Homemade Fun offers a generous collection of classic activities for kids and families who enjoy making creative projects at home, paired with delightful vintage art throughout. Parents, especially moms who are juggling kids, time, and a budget, can use this book as a resource when looking for ways to enrich and entertain their kids. Featuring a versatile compilation of classic crafts, games, and activities that are family and kid-oriented, the book can be used for many different situations including camp activities, after-school activities, birthday parties, rainy day events, and vacations as well. Homemade Fun will provide hours of family fun! RAE GRANT is a book designer, collage illustrator, and author. Her background in fine letterpress, printing, and bookmaking established her reputation for designing high-quality illustrated books. Rae lives in Manhattan with her daughter and husband. Her previous books are "Crafting Fun" and "Cooking Fun."